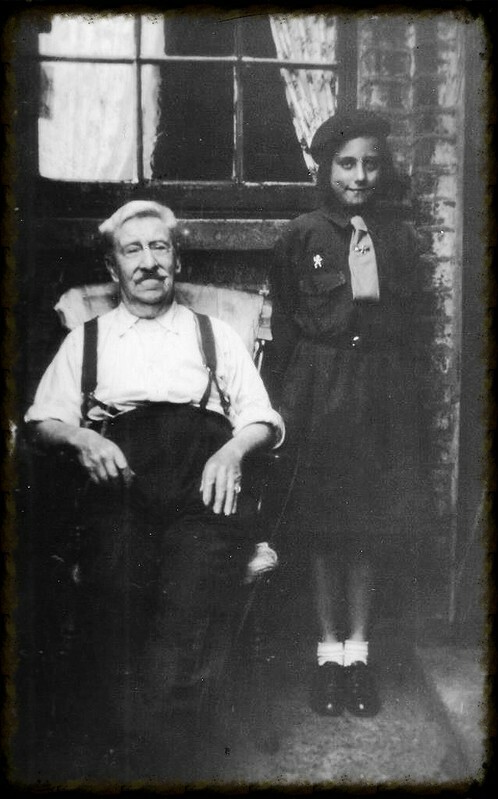 Me in my very first uniform at the age of about 7 with grandad in the back yard of our old house in the cockney East End of London. Yes, I was a so-called brownie, the junior group of the girl guides. I never got to the guides, I decided I did not need another unform. White socks were all the rage at the time. The next uniform was school. At the age of 11 I took my 11+ exam and qualified for grammar school. That was the higher shool of learning and we all had to wear a uniform, so mum and dad had to dip into their pockets and find the money to pay for it. I was now dressed in a green gym slip covering a beige square necked blouse. After the first two years we juniors progressed to a green skirt, not very flattering to the figure, with a beige blouse and yes a green and red diagonal striped tie. I remember the lessons dad gave me on how to make a tie knot. this uniform remained for the next four years. In winter we had a green gabardine coat with red and green striped knitted scarf and in Summer it was a green or red chequered dress with a blazer with the school badge. As we girls got older we pepped it up with perhaps raising the hem of the dress to a shorter length according to the fashion. You could try everything but we still looked like kids from an institution. One plus was that we did get a good education and many went on to university. I decided to play it the safe way, did not really know what to study and went into office work with all the trimmings. My next uniform was the daily office gear. This was now the sixties, the days of Mary Quant and Beatles and Twiggy. The skirts were tight, short and the heels on the shoes like stilts. we wedged our figures into everything, as long as the uniform fitted. Over the years uniforms came and went, all in the name of fashion, but we were still wearing our uniforms. You did not want to stick out in the crowd, although needed something different to the others. Due to being different, we eventually all dressed the same. If the fashion was wide trousers, you wore them wide like everyone else. Perhaps it was tight, so that was what you wore. Today in the 20th century we are all dress in our blue jeans, a t-shirt or pullover. We used to laugh at the Chinese when Mao was their leader, all dressed the same. Today they are dressed individually, no trace of chairman Mao. And us? Where are my trousers and top, the ones that everyone is wearing. Of course, we do not want to be dressed in uniform. 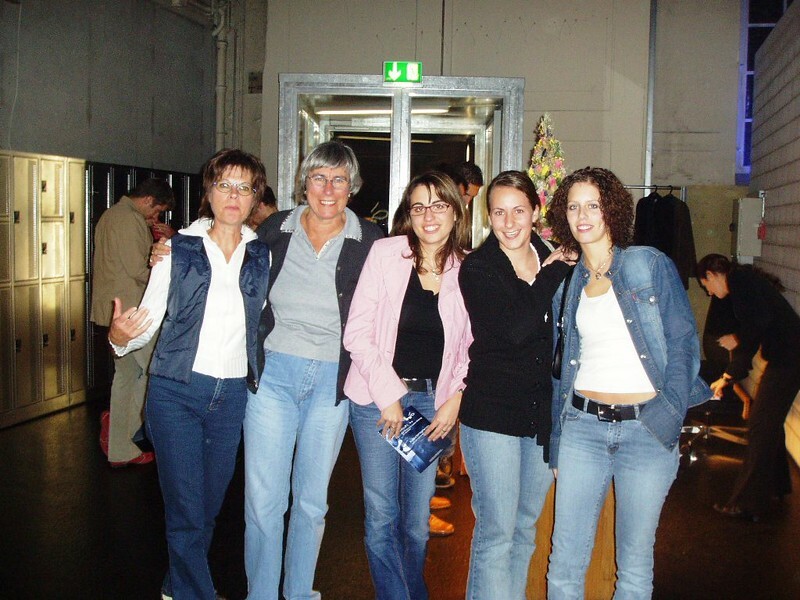 Me, second from the left – no we did not wear uniforms when we went on an excursion from work, we liked to dress individually – the blue jeans were a mere coincidence. Funny how blue jeans became what every rebel wears. You’d think it was fashion or something! In those days, we ALL wore blue jeans. I don’t think I owned any other pants.